The Fukuda Doctrine has been the official blueprint to Japan’s foreign policy towards Southeast Asia since 1977. This book examines the Fukuda Doctrine in the context of Japan-Southeast Asia relations, and discusses the possibility of a non-realist approach in the imagining and conduct of international relations in East Asia. The collapse of 54 years of Liberal Democratic Party rule and the advent of a new Democratic Party of Japan raises the question of whether the Fukuda Doctrine is still relevant as a framework to analyse Tokyo’s policy and behaviour towards Southeast Asia. Looking at its origins and norms amidst three decades of change, the book argues that the Fukuda Doctrine is still relevant to Japan-Southeast Asian relations, and should be extended to relations between China and Japan if an East Asian Community is to be built. The book goes on to discuss the Fukuda Doctrine in relation to the power shift in Asia, including the revitalization of Japan’s security role. 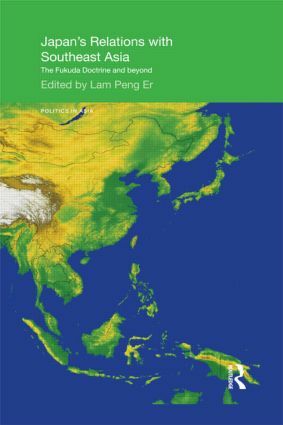 By providing a detailed understanding of a non-western perspective of Japan’s relationship with Southeast Asia, this book is a useful contribution for students and scholars of Asian Studies, Politics and International Relations. Peng Er Lam is a Senior Research Fellow at the National University of Singapore.